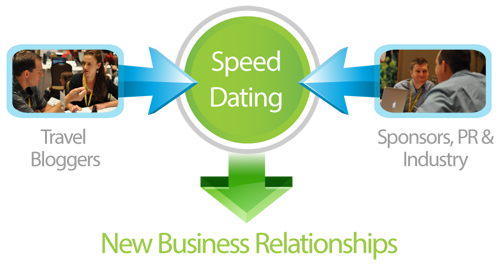 TBEX Speed Networking is a series of pre-scheduled custom meetings between Sponsors, PR & Industry (Destinations, Brands & PR Agencies, etc. who have rented a table) and Travel Bloggers utilizing the BloggerBridge software platform. The meetings are brief, just 8 minutes long, encouraging both parties to focus in on their objectives in meeting with one another - and keeping everyone productive, allowing for several meetings during the speed dating time period. TBEX and BloggerBridge are two different companies with two different databases. We will automatically import your registration from TBEX to BloggerBridge but it will take a few days. Don't register for an account. We will do that for you. If you register for an account and use a different email than you used for TBEX you will not be able to get into speed networking and you will make the admin grumpy. BloggerBridge is a website that helps connect bloggers and writers with their relevant contacts in companies and their PR representatives. BloggerBridge is used by companies 365 days of the year, not just for TBEX speed networking.